BREAKTHROUGH BOOK. Dr. Richard Colling, Ph.D., is an evangelical Christian (Wesleyan/holiness, to be more specific) who has been teaching biology at Olivet Nazarene University (his alma mater and mine) for many years. Until recently, he was head of the Department of Biology at ONU. 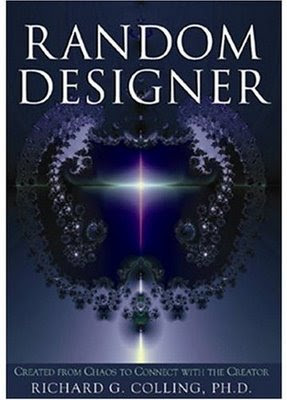 In 2002, Dr. Colling published Random Designer: Created from Chaos to Connect with the Creator, in which he put his profound faith and biology acumen together to postulate a theistic evolutionary process that is intended to bridge some of the typical barriers between Biblical faith and science. A BETTER WAY FORWARD. In Random Designer, Colling challenges the faulty underpinnings of scientific creationism and intelligent design on the basis of good, fundamental science. He offers a more scientifically-defensible and faith-authenticating line of thinking. If taken seriously, Random Designer offers evangelical Christianity a way forward amid the current us-vs-them, creation-vs-science morass. While Fundamentalists will likely never budge from their white-knuckled positions, evangelicals should consider Colling's work in Random Designer a gift with which to engage our culture and the scientific/academic community unapologetically with our Christian story. REACTIONARY BACKLASH. Some influential church and university leaders have not regarded Random Designer as a gift, however. On the contrary, enough of those who hold Dr. Colling's career at ONU in their hands, have reacted against it and him. As a result, his book has been banned from being assigned in ONU classes. Dr. Colling has also been prevented from teaching General Biology for the past two years. He has been made to run a horrendous gauntlet of suspicion, contradiction, innuendo, accusations, misstatements, and outright deception. Reading the documents reminds me of nothing short of an Inquisition in which, for all his efforts to speak the truth and get at the truth, Dr. Colling has been vilified and made to be the scapegoat for the university leadership's gross mishandling of the situation. READ "BETRAYED BY FAITH" FOR YOURSELF. But don't take it from me or the AAUP. Read the documents for yourself. I have provided links to the PDF documents below. See if you do not agree that "Betrayed By Faith" is a sad commentary on reactionary church and university leadership. If you believe Dr. Rick Colling should be vindicated by virtue of these documents, perhaps you could take the simple but important step to let university and the church officials named and addressed in the documents know. To me, these documents have enough substance to indict some church and university leadership on some very basic ethics violations. READ THE DOCUMENTS. Read all the documents--419+ pages of correspondence--that Dr. Richard Colling was required to submit to ONU leadership in Fall 2008. The content is important because it upholds the integrity of Dr. Rick Colling in his pursuit of the truth and fair treatment throughout the course of this debacle created by church and university leadership. Wow...I just finished reading the whole "Betrayed by Faith" document. It is a fascinating look at a breakdown in communication. The sad thing is that what could have been the basis for improved communication on an important topic in both the science and Christian communities has instead served to create a greater divide. As a professor at a Nazarene University I have witnessed too many times this type of breakdown in civil discourse between persons who really do ascribe to the same mission of Nazarene higher education. It is sad and it is clearly not reflective of a Christian ideal. Nice work John. I've read the book and enjoy the breath of fresh air that ideas of this type bring. I'm afraid that Pres Bowling is playing to his moneyed constituency over any academic honesty concerns. It will the next generation of leadership that will embrace this seismic shift in theologal underpinning. Is there a safe haven from worldly views? When opinions of people like Dr. Collings are scrutinized by the church because of their noncompliance with scripture. The result is an upevil of many crying "censorship." But when a teacher, such as myself, tries to inject bibical creation into the public science classroom we are shut down, threatened in some cases with our jobs, and told that we are bringing our religious views into a public forum. If Olivet and other schools are not allowed to be the counterbalance to such nonsense, then where will true believers be able to go to recieve the information in line with their faith. Evolution takes as much or more faith than a 7 day creation. The question will always remain whether in evolution or creation... Where did it all come from? While I agree with some concepts around evolution, I could never accept that any thing as complex as the organisms found on this earth could be a result of randomness in any way. I further want to suggest it is impossible to separate the origin of the universe with philosophy. Science is constrained by time and observablility. Therefore, any theory of a beginning will be based on "faith" in that theory. Is it too much to ask that a faith based institution be focused on faith in creation? Okay, I let the previous post stand, but, please, no more "anonymous" posts--not on this subject/issue. It's just too important. I think the post evidences a lot of frustration and reflects the commonly-held, emotionally-charged perspectives of many conservative Christians who have listened to or read Hamm (of the Creation Museum perspective) and others. I would simply suggest that you begin by reading "Random Designer" with as open a mind and heart as you've read anything that purports to defend Christianity from evolutionists. Then, let's talk.